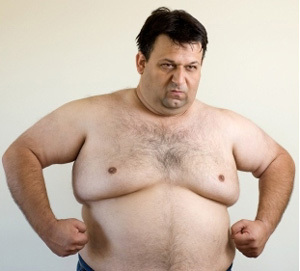 Infinity Health and Wellness Center: Estrogen Weight Gain in Men?! For many relatively fit men, developing a paunch around the middle appears to be a practically inevitable part of aging. Even if you've avoided any major weight gain until your 40s, that belly starts to expand. You cut back on calories, do some extra crunches at the gym, but still you notice a little bit of padding that wasn't there before. Yes, this does have to do with getting older, but the more specific reason scientists have found for it might surprise you. The answer appears to lie with estrogen, the hormone typically associated mainly with women. According to the research, which took place at the Harvard Medical School in Boston, Massachusetts, dips in estrogen may have a major influence on the weight men often put on in middle age, very similar to the effect they are known to have on women's bodies.1 The changes that take place to many men's bodies--which often include some loss of muscle and a dampening of the libido as well as the development of a spare tire--have long been linked to the declining levels of testosterone. But the new study reveals that it is not just due to a lack of testosterone, but lower levels of estrogen too. The subjects were 400 men between the ages of 20 and 50 who were willing to allow the scientists to halt their body's natural production of testosterone with injections for a 16-week period. They were randomly divided into two groups. The first group was given varying amounts of testosterone. The second group was provided with testosterone as well as a pharmaceutical medication that stopped all estrogen synthesis. This allowed the researchers to compare the volunteers with testosterone and estrogen with those who only had testosterone present. Those men who were "made" unable to produce any estrogen had more negative effects than their peers whose estrogen levels had not been tampered with, and these effects included the accumulation of fat and severe hot flashes. This men's health issue actually parallels what happens to women as they age. Women have an abundance of estrogen but very low levels of testosterone. In other words, when it comes to testosterone, the margin of error for women is very small. Just a small drop in testosterone levels for women can make a huge difference physically and in quality of life. For men, the problem is that under normal circumstances, they maintain a very low, but very necessary level of estrogen in their bodies. When that level of estrogen drops even a little, the effects on men are equally profound both physically and in terms of quality of life as a small testosterone drop is for women. But the connection goes even deeper. Our bodies, both male and female, use testosterone to create estrogen. Men can make plenty of estrogen naturally before they start developing any feminine physical characteristics. Through the aging process, men begin to produce less testosterone and therefore less estrogen as well. While the normal range for testosterone is rather wide at anywhere from 300 to 1,000 nanograms per deciliter of blood serum, a typical level in a man is approximately 550 nl/dL.2 Over time, however, this level will naturally drop and is usually considered deficient and worth treating when it hits around 300 ng/dL. According to the study, surprisingly, it is before that point--when the testosterone sits just above the 300 marker between 300 and 350 ng/dL--that estrogen levels suddenly plummet and begin causing weight gain. It should be noted, however, that it was not until the participants fell below 200 ng/dL of testosterone that lean body mass and strength were impacted. So, what's a guy to do as he is getting older and his body is just not producing enough testosterone and estrogen on its own any more? Instead of going with the pharmaceutical products, or even supplementing naturally, why not try optimizing what you already have in your body instead. A testosterone balancing formula helps maintain equilibrium among your body's hormones, "unbinding" the testosterone already in your body so that what you have becomes more useful in the anti aging process. In other words, useful levels increase without any harmful change in overall levels. And the effects will be noticeable, not only in your midsection, but in your energy, muscle tone, and libido as well. Yes, I once also had weight problems. It turned out it was all because of the harmonies. I lost about 5 kilograms after the treatment. Look at these indicators for normal testosterone levels for 40 year old male so it should be for all men, for a healthy life.